As a senior this year, All-American defensive tackle Will Sutton became one of Arizona State's vocal leaders, according to coach Todd Graham. 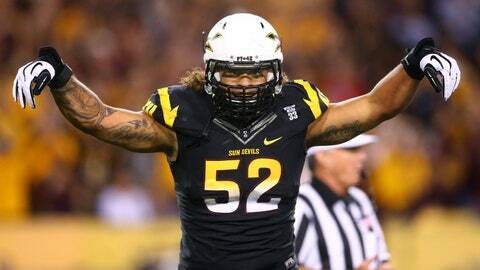 TEMPE, Ariz. — Arizona State coach Todd Graham defended All-American defensive tackle Will Sutton on Saturday after learning the senior’s character had been questioned earlier in the week. On Wednesday, NFL.com published a story in which five anonymous NFL executives were asked what prospect has the most to prove between now and the NFL Draft. One said Sutton and offered this take: "There are serious questions about his character, fitness and athletic ability. He was out of shape this fall and wasn’t nearly the same player that he was the year before." It was not the first time Sutton’s fitness and athletic ability have been questioned this season, but when asked about the remark about Sutton’s character, Graham took exception. "They need to call me," Graham said. "Because how he’s matured and how he’s developed as a leader of this football team — and I mean that from a character standpoint — I’d obviously highly recommended him and highly disagree with that (criticism). "You look all over the country and people make statements and people think they know you, and they don’t know you. I work with him here every day." Graham has praised Sutton as one of the team’s vocal leaders this season despite his initial reluctance to take on that role. That leadership could be seen on the sidelines late in close games and on the Pac-12 Network series "The Drive." Sutton repeated as an Associated Press All-American, the Pac-12 Defensive Player of the Year, a first-team All-Pac-12 selection and the Morris Trophy winner, which goes to the Pac-12’s top offensive and defensive linemen as voted by opposing linemen. Graham has stressed all season how much Sutton has matured since his stellar junior season, and he did so again Saturday. "How he’s developed and matured is … I mean, I’ve never had a great player mature that much," Graham said. "Did he need to mature? Yes, he did. Did he? He did. He became the leader of this team and a guy I think’s going to be highly successful at the next level. "Any time you’re in the spotlight, everybody wants to bring you down. Everybody wants to say negative things about you. They don’t work here. They’re not here. Anybody who says that don’t know what they’re talking about. … It’s unfortunate somebody would say something like that." ASU had its final practice of the season in Tempe on Saturday, and the team was unusually energized for a group of college athletes about to get three days off for Christmas. "The guys had an unbelievable spirit practicing today," Graham said. "These guys had probably one of the best practices we’ve had all year today on both sides of the football." 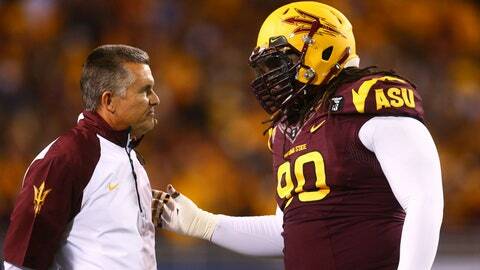 ASU broke for the holidays after Saturday’s practice. Players are required to report on Christmas day to San Diego, where ASU will practice four more times before playing Texas Tech in the Holiday Bowl on Dec. 30. Perhaps a little of the extra enthusiasm Saturday came from ASU’s large senior class, which went through its final on-campus practice. "I spent a lot of time thinking today about these seniors — last day that they’ll ever practice on this campus," Graham said. "And, man, what a great group they’ve been." — Graham wouldn’t rule out running back Marion Grice for the Holiday Bowl despite his not practicing since suffering a left leg injury Nov. 23. While it seems unlikely Grice will play, Graham said he is "50-50" after having an X-ray this week. He’ll have another X-ray in San Diego. — Running back D.J. Foster (knee) participated normally Saturday, going through 11-on-11 contact drills with the first-team offense. He appears on track to start the Holiday Bowl. — Safety/linebacker Laiu Moeakiola has been dealing with a knee sprain, Graham said, but is expected to be healthy for the Holiday Bowl. — While most players, coaches and staff members will be out of state or with family locally for Christmas, some cannot afford to travel or don’t have family here. Graham has opened his doors to them and will host more than 30 players and football staffers at his home on Christmas Eve.